Formerly known as Piesse Brook Wines, we are a small family winery in the Perth Hills specializing in hand crafted wines from fruit grown entirely on the estate vineyard. This means the furthest our fruit travels is about 100m to the winery, where practically all the winemaking procedures are done by hand, from hand picking and hand sorting the grapes to winding up the hydraulic wooden basket press to gently extract the wine press fraction. Relatives and friends join in and help at critical times, including vintage and pruning, but Aldersyde is essentially a mother-daughter operation, with Larissa looking after the vines and winemaking and mother, Di, in charge of cellar door sales. Lara took over responsibility for the business in late 2007, resigning from her winemaking position at Cape Mentelle in Margaret River. Born and raised on the vineyard, Lara is happy to finally be home, having covered many parts of the globe over the past 10 years in her quest to refine her winemaking skills and understanding of wine styles. She takes over from Di and Di's brother, Ray Boyanich, who ran Piesse Brook Wines as a partnership for over 20 years. Click here to read About Lara. 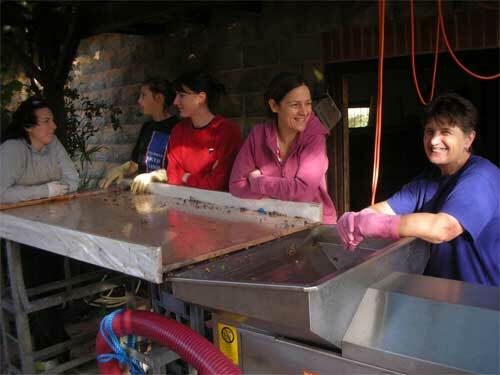 Since 2008, the business has seen some significant changes, both in the winery and the vineyard, including the purchase of more stainless steel tanks and a new crusher, installation of an industrial hot water system, rejuvenation of several vineyard plots, cultivation of mid-row covercrops and the installation of a cool room for vintage 2010. We invite you to chat with Di at cellar door and enjoy a glass of wine while learning about the history of our property. 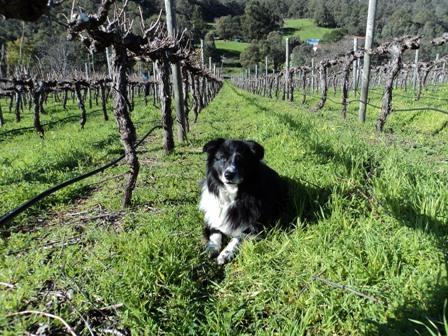 Our winery dogs, Oban (pictured on label) and Zoe, are sure to keep the kids entertained. Wine unites our family and gives our lives passion and drive.